The family will spend the next year in Israel on sabbatical, living and loving the land in person. It’ll be a fond, albeit emotional, farewell for Meyer Denn and family at 5:30 p.m. Thursday, May 24, at the Aaron Family JCC’s Mankoff Center. 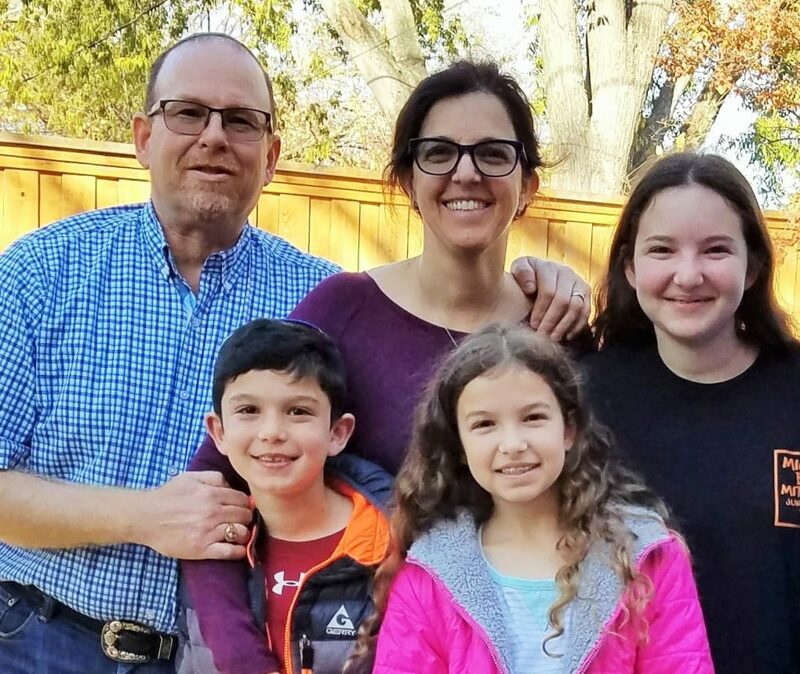 Fulfilling a dream, Denn, outgoing director of the Jewish Federation of Greater Dallas’ Center for Jewish Education (CJE), and his family will take a Sabbatical year in Israel — following their hearts to share the land, lore, and links to their heritage. With careers of teaching the core of the Jewish people at the core of this couple, Denn and his wife, Marni, look forward to having history come to life for their children Sydney, Jordan and Xander. “We’ve wanted this gift for our children, and we’re so blessed to live in a time of miracles when the Jewish people have returned and are prospering in our country,” said Denn, who hopes to work in Diaspora affairs, education and engagement, and also share the country with tourists (“Come on Texans,” he says). Denn was born in Wharton, Texas, and raised in Bay City. An involved Young Judaean in his youth and active in communal politics from early on, as a high school senior Denn ran for and won a seat on the city council. With a Bachelor of Arts in history and Judaic studies from UT Austin, he moved to Los Angeles where he served as executive director of the Pacific Jewish Center. In 1997 he moved to Israel, working for the Jewish Agency and as a licensed tour guide. After returning to Los Angeles, where he pursued a bachelor’s degree in literature, a master’s degree in education and an MBA in nonprofit management from the University of Judaism, he reconnected with Marni, and his future was solid. Since Denn’s arrival in Dallas, the then JED, Jewish Education Department of the Federation, has transformed into the center of our community, now the CJE. Ten years ago, Denn told the Texas Jewish Post that “as I’m meeting with rabbis, heads of school, teachers and lay leaders of the community, I’m finding an enthusiasm that is contagious and I couldn’t be more thrilled. It’s beautiful.” Ten years later, that sense of community and his commitment to understanding and enhancing it is his legacy. “My role is to promote all types of Jewish education: day school, congregational, through organizations and agencies, and to bring crisp and new ideas through which we can partner,” Denn said. Brought to Dallas as an enthusiastic and passionate visionary with the sharing of a new breadth of Jewish education and Jewish life, he’s opened many doors to help members of the community explore their Jewish identity. Denn helped formulate numerous professional development opportunities for the community’s educators including the attendance of 200 early childhood educators at the National NAEYC Conference, bringing the Conscious Discipline philosophy to the community, sending 24 educators to Israel as part of the Schultz Israel Educator Fellows to teach Israel in the classroom, and the funding of scholarships for three community educators to receive master’s degrees from the Simmons School of Education at SMU. Almost 2,300 children receive free books through PJ Library and thousands participated in LearningFest programs. The Night to Celebrate Jewish Education events hosted several distinguished speakers, all of whom also addressed area day schools. The CJE supported strongly the growth of the Special Needs Initiative into becoming the Special Needs Partnership at Jewish Family Service and through Incubator Incentive Grants, CJE invested nearly $100,000 to seed new and innovative programs. Technology grants for early childhood educators, Shabbat Scholars-in-Residence and this spring’s 13 Reasons Why NOT: Turning the Tide of Teen Suicide are additional examples of the impact Denn and his department has had on the community — the full list able to fill pages. Denn believes his staff and all he’s worked with are positioned to maintain the department’s strengths. “We’ve constructed an educational landscape and brought the community’s leadership to understand how to serve its constituents,” he said. Denn and his wife moved to Dallas in 2008 with their daughters and with the imminent debut of their son that fall. Akiba Academy, where Marni taught for years, has been their children’s academic home. With Sydney now headed for high school, the season was right for a family adventure of a lifetime. Given that home is where the heart is, the Denns will always be home, wherever they go. Shalom y’all — it’s just the beginning. The goodbye is co-chaired by the Mankoff, Risch, and Schultz families and the Jewish Federation of Greater Dallas’ Center for Jewish Education. There is no cost to attend, but RSVPs are requested by email to kschlosberg@jewishdallas.org. Anyone wishing to share stories, photos or well-wishes should email them to jaynie@jaynieschultz.com, and anyone wanting to share in a donation to the family can send such to the Denn Fund at the Jewish Federation of Greater Dallas, 7800 Northaven Road, Dallas, TX 75230.